Blue Water Grill never ceases to impress with their generosity towards the San Pedro Community. In February, they announced a monthly donation program to raise money for the different charities across the island. 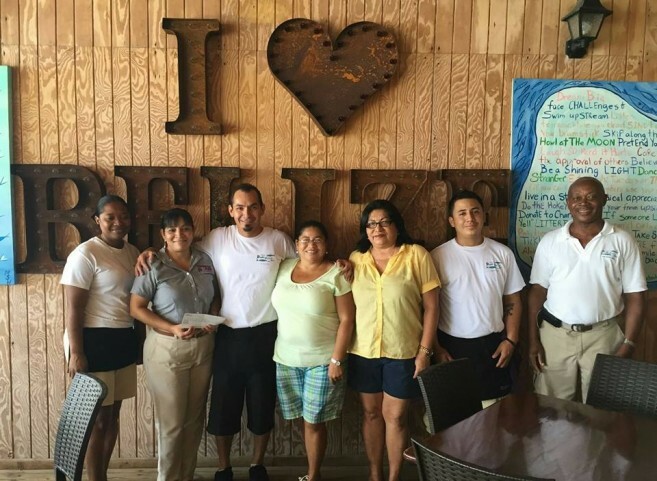 Every month, they will raise money for a different cause, via patrons’ donations at the beachside restaurant. At the end of the month, Blue Water Grill gives 100% of the money donated to a new charitable effort. In addition, they match up to the first $2,000 donated. For the month of February 2015, the San Pedro Cancer Society was the recipient of Blue Water Grill’s first donation. Customers donated $392 which was matched 100%, so a check of $784 was handed over to San Pedro Cancer Society members, Lucy Muñoz and Pamela Zetina. The San Pedro Cancer Society is extremely grateful for the donation and extend big thanks to all those who donated. March’s recipient will be the San Pedro Roman Catholic Primary School. All money contributed will be used to replace the rotten floor in a classroom and fix broken windows at the school building. Blue Water Grill would like to take the opportunity to thank everyone who has helped make a difference in the community. Kudos BWG!